As an alumnus of Florida State University for both undergraduate and graduate degrees, I feel honored to be part of the Seminole 100 program. The education I received at FSU laid the foundation for my career in immigration law, and the university represents a large piece of who I am. Rambana & Ricci, P.L.L.C., a Tallahassee-based law firm concentrating on complex immigration legal issues, has been named an honoree on the 2019 Seminole 100 list. The annual list, composed by The Jim Moran Institute for Global Entrepreneurship at Florida State University’s College of Business, recognizes 100 of the fastest-growing U.S. businesses owned by Florida State alumni. The 2019 Seminole 100 includes a wide range of industries and businesses of all sizes located across the U.S. Information submitted by each business was verified by EY, a multinational financial services firm that ranked the businesses based on compounded annual growth rate over a three-year period. Rambana & Ricci advises employers in W-4 and I-9 compliance; represents stateless individuals (those without citizenship of any country) and wrongly detained U.S. citizens; and actively files for green cards without sponsors (EB-1 and EB-2 cases). 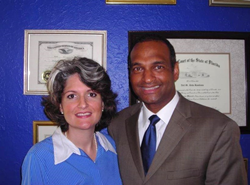 The firm’s partners, Neil Rambana and Elizabeth Ricci, have been married for 16 years. “We are proud to be recognized on the Seminole 100 with other notable businesses from the Florida State family. We established our firm almost 20 years ago and look forward to continued growth in the years ahead,” said Ricci. Both Rambana and Ricci received their Juris Doctor degrees from Nova Southeastern University’s Shepard Broad College of Law. Rambana received his master’s degree in International Affairs, as well as a bachelor’s degree in English and Political Science with a minor is Public Administration from FSU. Ricci received her bachelor’s degree in International Business from Barry University.